In preparation for this year's nesting, all wooden nest cups were removed and rehung, none within 4 feet of last year's nest. All nest cups were photographed from the top and the front before mounting. This provided a reference image to determine when mud was smeared on the rim or grass or mud was added to the cup. Nests were checked daily with a mirror and taken down for closer examination as required. Top down photos were taken whenever the nests were removed for inspection. 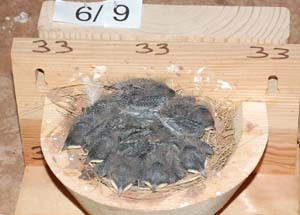 Approximately half of the nests were emptied the day the young fledged and the nest contents saved in a zip lock bag. 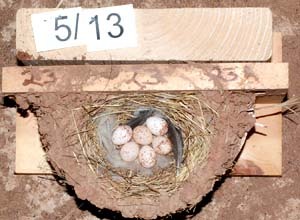 Other nests were left untouched, to determine if emptying the nests between broods had an effect on reuse for the second brood. Nest cups were identified by numbers located on the front and top of the backboard. 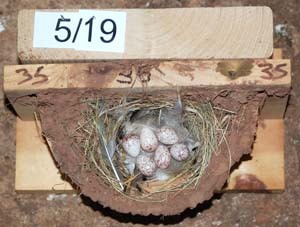 The nest number was placed in triplicate on the top of the board so at least one was likely to not be covered with mud. 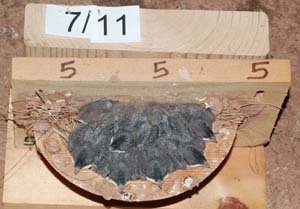 Nests to be photographed were removed and placed on a base with the current date displayed. Note the seven nestlings in the above photos. 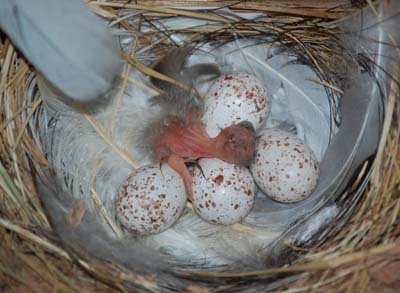 While nests seem crowded, there have been no more fall outs with six and seven nestlings than with four or five. This year there was only one fall out in a nest of 5. It was much too young to fly and was replaced in the nest. The next day it was under the nest again, this time dead. The other 4 nestlings fledged normally. The nestling in the photo at right is exercising it's wings while clinging to the rim of the nest. They seem quite capable of maintaining their grip, but I never approach the nests at this stage. Premature fledges are usually caused by fright, not clumsiness. 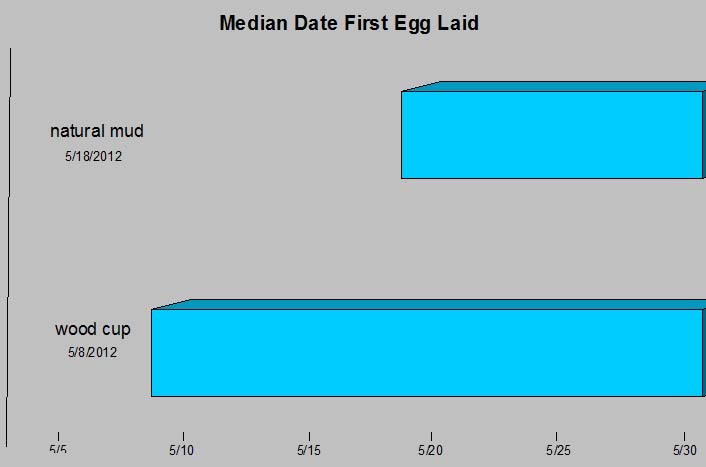 Nest #20 was out of sync with the other nests, and accounts for the long tail at the end of the second nesting. Five eggs were incubated in #20 for 18 days and then pitched. A new clutch was begun 5 days later and two broods of 5 and 4 fledged successfully. As in previous years, the wood nest cups were readily accepted even though all cups were relocated at least 4 feet away from any location used in 2011. 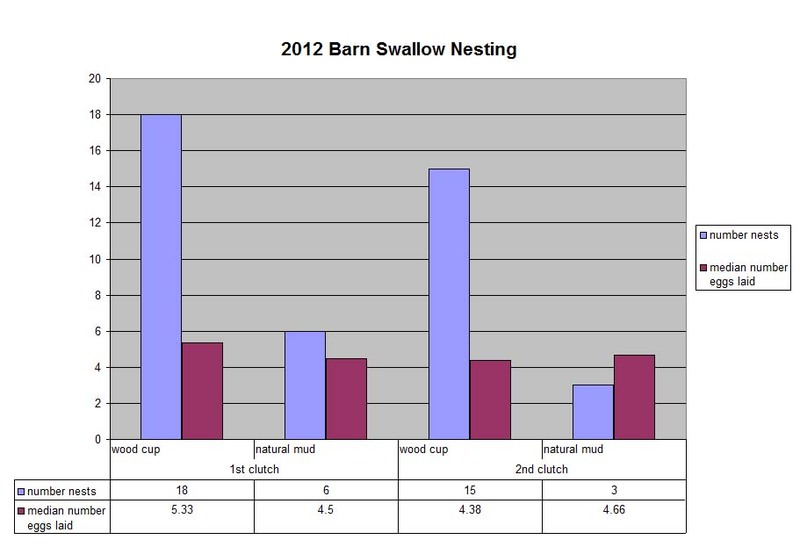 18 of the 36 wood cups were used for the first brood and 6 new mud nests were built. 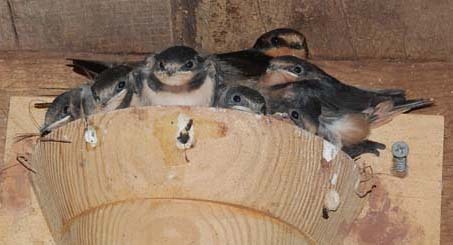 None of several old mud nests were used for the first brood. And, none of the 6 new mud nests were built where a 2011 nest had been. (A reminder to myself - we don't always find what we expect). 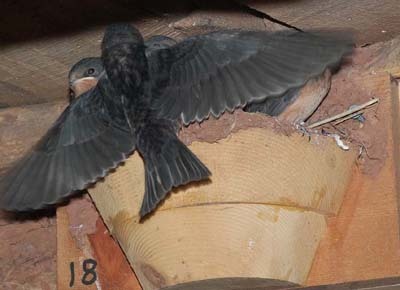 Swallows using the wood cups had a 10 day headstart on those pairs building a mud nest. 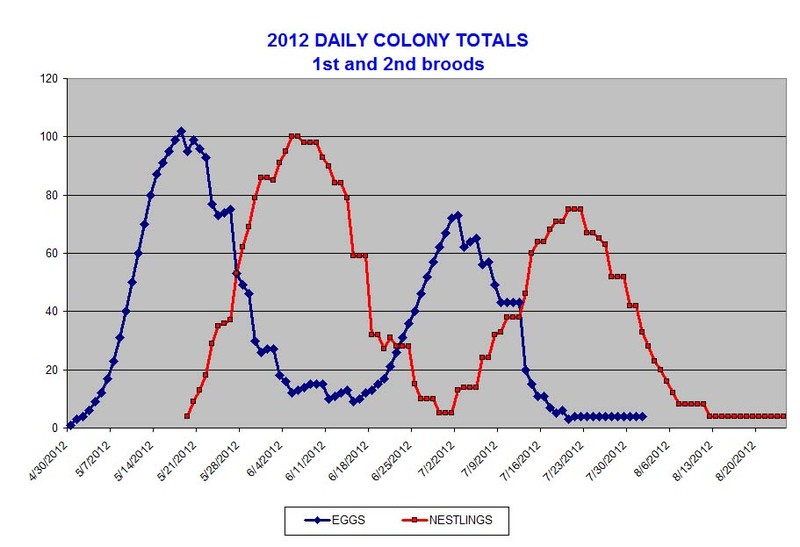 This year, this may not have been much of an advantage because August was cooler and wetter than usual and late nestings did fine. 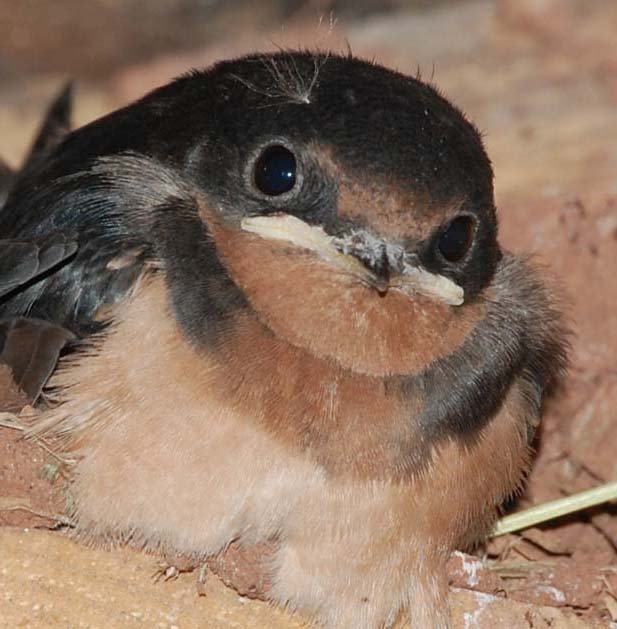 Often August is much hotter and bone dry, taking a toll on late nests. &COPY; 2012 American Artifacts and Richard Van Vleck, Taneytown, Maryland.